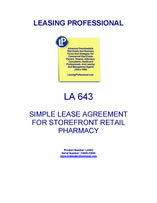 This simple lease form is for a storefront retail pharmacy lease. In addition to the specified rent, the tenant is obliged to pay for all insurance, taxes, and utilities for the leased premises. The tenant is also obligated to maintain the interior and exterior of the premises.